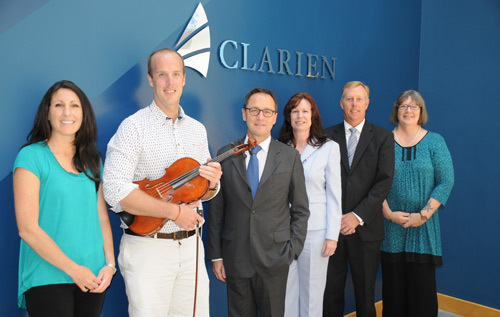 Today, Clarien Bank Limited, “Clarien Bank” announced the first of its 2014 charitable donations. Clarien Bank, formerly Capital G Bank Limited, has a long-standing commitment to the local charitable community and has been contributing both in cash donations and giving of time to a broad cross-section of philanthropic associations on the island for many years. Early childhood development, youth development, families and the environment remain key segments of Clarien Bank’s giving strategy. As a result The Menuhin Foundation, The Reading Clinic, The Bermuda Zoological Society and The Family Centre have been selected as the first recipients of the Clarien Bank philanthropic fund. Clarien Bank’s partners represent an early childhood reading programme nurtured by The Reading Clinic and supported by Clarien Bank employees as reading mentors. The Menuhin Foundation cultivates musical expression in students learning string instruments. For several years The Family Centre and Clarien Bank have created a fun and spirit-filled fundraiser around the two-day Cup Match holiday to encourage and celebrate the importance of children and families. Conservation and environmental education programmes at the Bermuda Aquarium Museum & Zoo are fostered by The Bermuda Zoological Society. These are only a few of Clarien Bank’s philanthropic endeavours. Clarien Bank is in the early stages of establishing the Clarien Bank Charitable Trust that will execute all future donations and sponsorships. The Clarien Bank Charitable Trust will serve as the umbrella for the company’s giving initiatives and employee volunteer outreach projects as the Bank solidifies its commitment to corporate citizenship. To find out more or to apply for funds from the Clarien Bank Charitable Trust, please call 294-5194 or email giveback@clarienbank.com.